Dr. Vaughan: Do We Need to Take Supplements? 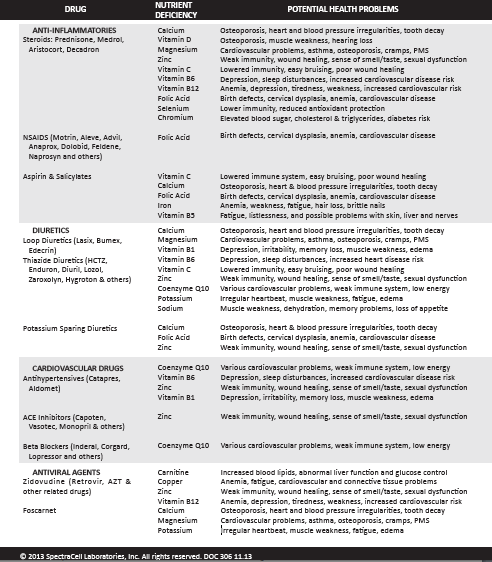 Do We Need to Take Supplements? Is just having a “healthy” diet enough to provide all the nutrients and minerals the human body needs to maintain a healthy, active and vital life? We live in a polluted world where we are exposed to toxins as early as in the womb. Our food supply is grown in mineral-depleted, nitrate-rich soil and then sprayed with pesticides and herbicides. Produce is picked so early it is still green and has not developed its full, nutritious potential. Much of our food is genetically modified, and the full impact of hybridization has not yet been fully realized. Even organic produce may have pesticide residues from cross contamination during transportation and drift from nearby spraying. Newer organic farms, even after certification, will not have soil as healthy as older ones. There is no doubt that supplementation is a necessity. We do not make vitamins or minerals within our bodies; we must obtain these nutrients from the foods we eat, which, in turn, obtain nutrients from the soil in which they are grown. In the U.S. our soils contain 86% less minerals than they did 100 years ago (based on a study done in 1992). In 2004, The Journal of the American College of Nutrition published a study that found significant declines in the mineral and vitamin content of 43 garden crops grown in U.S. markets. Due to these lower levels of magnesium, calcium, and selenium, and because conventional agriculture crops are raised in soil where crop rotation is not practiced, the balance of nutrients, organic matter, and microorganisms necessary for healthy soil does not occur. Rotating crops helps maintain this balance and also interrupts disease cycles. Sometimes lengthy cycles are necessary to control chronic, soil-borne problems like some fungal diseases. Interestingly, plants actually fend off a range of insects with their own natural defense mechanisms--compounds called phytonutrients. When allowed to grow without the assistance of insecticides and herbicides, plants develop higher concentrations of these compounds that, coincidentally, have healthy properties including antioxidant, anti-inflammatory, anti-cancer, and liver-health-promoting activities. They also provide the plants with characteristics such as their color, flavor, and smell. According to some studies, organic crops are higher in vitamin C, iron, natural sugars, magnesium and phosphorus, and are lower in harmful nitrates than conventionally raised crops. An independent review, published in the Journal of Alternative and Complimentary Medicine, found that organic crops had significantly higher levels of all 21 nutrients evaluated than did conventionally grown produce in the U.S. and Great Britain. Organically grown spinach, lettuce, cabbage and potatoes were found to have high levels of minerals. Conversely, a separate study found that conventional, nonorganic vegetable crops grown between 1940 and 2002 in Great Britain showed mineral losses from 15% to 62%. In a Canadian study, there was also a significant decline in the nutrient content. This decline was over a 50-year period 1949 to 1999. During this time period, fruits and vegetables lost 57% of their vitamin C and iron, 28% of their calcium, 50% of their riboflavin and 18% of their niacin. When pesticides and herbicides are used, they kill the bacteria and fungi that promote nutrient uptake in plants. They also deactivate the systems within the plant roots that are involved in mineral absorption. Pesticides and herbicides also destroy soil microorganisms needed to create the organic-mineral complexes that naturally replenish the soil. Chemical fertilizers deplete vital micronutrients and trace elements, and reduce their bioavailability to plants. Commercial nitrogen+phosphorus+potassium fertilizers (NPK) gradually reduce soil pH, making the soil too acidic to support beneficial bacteria and fungi. As stated, these organisms assist plants in absorbing nutrients from the soil, so eliminating them significantly impairs the plants’ uptake of micronutrients. In addition, NPK application has been found to bind soil-based selenium, making it unavailable for root absorption. In one study, organic fruit crops were found to contain higher levels of flavonoids and polyphenols than conventional fruits—including up to 50% more antioxidants. Conventional crops also have increased levels of heavy metals such as lead and mercury, and solvents like benzene and toluene. Heavy metals displace the body’s minerals in biochemical reactions, leading to dysfunction and disease. Pesticides and herbicides have also been linked to a wide range of health problems including decreased immune function, hormone function, diminished intelligence, reproductive problems, neurological and behavioral problems, and cancer. They are also endocrine hormone disruptors. Pesticides and herbicides can easily pass through the placenta to an unborn infant, and some toxins are actually concentrated across the placenta. Women actually reduce their toxic load by transferring it into their unborn babies. This happens with lead and mercury. Additionally, the fetus is extremely vulnerable to toxins that disrupt the developmental process. A Body Burden Study by Environmental Working Group in 2004 found toxins in fetal cord blood, amniotic fluid and meconium. Babies come into this world with an average toxic burden of 200 chemicals and toxic metals. After birth, children are also particularly susceptible to pesticides because of food–to-body weight ratio and a developing immune system. Minimizing exposure to these toxins by eating organic foods is important for our (and our children’s) health. Supplements can help replace the nutrients lacking in our foods and support the body in detoxification of the increased toxic load. Around 10%-15% of the population are considered “canaries”, meaning they are the most affected by the toxins and get excessively sick. Others will get sick over time. Toxins work synergistically; the accumulative effect is far greater than the individual effect. Toxins block or interfere with detoxifying pathways, damage the machinery inside the cells, and compromise the body even further. There have been nearly 90,000 new chemicals introduced since 1990; more than half are small enough to enter the body’s cells, where they damage the nucleus, mitochondria and endoplasmic reticulum (the cell “brain, power houses and factories,” respectively). If our body could not detoxify itself, we would be dead in 6 hours. Dr. Sydney Baker, a well-known functional medicine pediatrician, suggested that 80% of our body’s energy, as adults, goes to detoxifying. We have different pathways for detoxifying our bodies. The liver is the main detoxifier, but our skin, hair and nails, kidneys, gut and lungs also detoxify their share. The liver is primarily a third-shift worker; overnight it detoxifies hormones, medications, environmental toxins, heavy metals, and waste products from daily cellular activity and others in two phases. Most environmental toxins are fat-soluble to start with, so they are difficult or impossible to eliminate without the liver’s help. In Phase One, the liver uses oxygen and enzymes to oxidize toxins, converting them from fat-soluble to water-soluble. Making toxins more water-soluble is necessary so they can be eliminated from the body by the kidneys or the liver. Frequently the end product of Phase One detoxification is more dangerous than the original compound being detoxified. These oxidized molecules are highly charged free radicals. They can damage the liver if not eliminated efficiently. This is why Phase Two, the conjugation phase, is so important. In this phase, oxidized molecules are combined (“conjugated”) with sulfur, specific amino acids, organic acids or glucose. These larger water-soluble molecules are then released harmlessly into the blood to be excreted by the kidneys or are excreted by the liver into bile and eliminated through the bowels. Eating organic foods promotes Phase Two processes. Both phases of liver detoxification are inhibited by nutritional deficiencies, accumulation of toxins, medications, alcohol consumption, and a diet not containing enough protein. The liver definitely needs daily protein, phytonutrients and vitamins and minerals to detoxify the body. Unfortunately, most individuals often do not consume enough nutrients in our diet to detoxify our bodies, and some individuals never consume enough! Toxins further deplete the body of vitamins and minerals since these nutrients are consumed while detoxifying the toxins themselves. To complicate this further, all of us live with too much stress--we don’t sleep enough, we don’t exercise enough, and we are inflamed--making the nutritional demands on our bodies even greater. Those with chronic illnesses are in even worse shape. Those on medications also have more to detoxify. Supplements will help the body handle some of this load. When stressed, the body uses excessive amounts of B vitamins and the kidneys excrete large amounts of magnesium. This, in turn, causes increased mental stress, depression, fatigue and instability. B vitamins are critical cofactors for almost all enzymatic processes in the body. In fact, Phase One detox (referenced above) completely shuts down without them. Serotonin and melatonin production also shuts down without B vitamins. Magnesium is a cofactor in over 300 biochemical reactions in the body. Deficiency of magnesium causes anxiety, cramps, twitching/spastic muscles, insomnia, high blood pressure, and asthma. When there are not enough available vitamins and minerals, the body is more susceptible to illness. If all of the environmental toxins and nutritional deficiencies in our food weren’t enough, there are medications that significantly lower our ability to absorb nutrients and digest protein, and can even deplete certain vitamins, minerals, amino acids and coenzymes. Supplementation can help make up the deficit. Having enough stomach acid is a factor in good digestion, absorption and immune health. Without enough stomach acid the body does not absorb essential nutrients. These include B-12, folic acid, zinc, selenium, magnesium, calcium, and iron. Stomach acid is also necessary to begin the process of digesting proteins in the stomach. Once the acid reaches the small bowel, it is the strongest stimulant to trigger the release of pancreatic enzymes, which further break down proteins and other foods components during digestion. If your gut cannot break down the food you’ve consumed (regardless how organically it has been produced), then the nutrients will not be available for absorption into the body. Taking proton pump inhibitors (PPIs) such as omeprazole (Prilosec), lansoprazole (Prevacid), and pantoprazole (Nexium), decreases the production of stomach acid. Lasix, a diuretic, may deplete potassium, magnesium and calcium. Statins may deplete CoEnzyme Q-10. 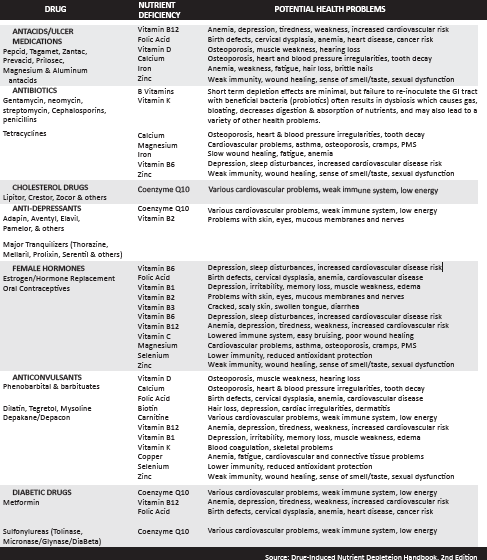 Estrogen-containing oral contraceptives may deplete Folic Acid, Magnesium, B6, B2, B1, B-12, Vitamin A, Vitamin C, and Zinc. PPIs may deplete Beta-Carotene, Chromium, and Vitamin C.
Anti hypertensives (called ACE inhibitors) may deplete zinc. It is so important to use physician-recommended, pharmaceutical-grade supplements from reputable supplement companies. These companies make sure the ingredients are not adulterated, and that they are well-absorbed by the body. You may pay a little more for these supplements, but their increased quality and bioavailability are worth the extra expense. You should detox once or twice a year with a detox cleansing routine. Look for pharmaceutical grade detox kits that are packed with vitamins, minerals, herbs and amino acids that assist your body in reducing your toxic load. There are also year-round supplements that you can take every day to support your detoxification pathways as well. These can include N-Acetyl Cysteine, Glutathione, Glutamine, Glycine, Methionine, Silymarin and Dandelion. If you get tired of swallowing pills, there are alternative options. There are minerals that are chelated and are more easily absorbed. “Super Food” products – powders, drinks and bars that contain condensed vegetables and fruits – are loaded with phytonutrients and antioxidants. There are pre-workout shakes, post-workout shakes, and protein shakes. There are even free Amino Acids (pre-digested protein) for those who have difficulty breaking down and absorbing protein. The good news is that testing is available for a wide variety of nutrients. Simple blood levels of nutrients may indicate a deficiency; however, these tests may also miss significant deficiencies in various tissues. For example, many patients get B-12 levels and are told they are within normal range. But a better test is a methyl malonic acid test, which indicates not only that B-12 is sufficient but that it is also doing its job. Another wrinkle in the B-12 story is that if one is deficient in zinc, B-12 cannot get into the brain. So the blood level looks normal, but the brain is suffering. There are also lab tests for genetic glitches, which cause functional deficiencies. Many patients have normal folic acid levels in their blood, but they have a genetic mutation that prevents them from activating the folic acid. This may increase their risk of heart disease, serious birth defects, and depression for starters. Micronutrient testing is available from specialty labs that are sometimes covered by insurance. This allows the doctor to order multiple nutrient levels at one time. Of course eating healthy, organic, local produce, exercising, avoiding environmental and food toxins, and adding supplements are the best recommendations to stay healthy. An integrative doctor can order the right tests to see if you are in need of vitamins, minerals, amino acids, neurotransmitters, and more stomach acid for their absorption, and make recommendations for appropriate supplementation.